Instructional Design - Infinity Human Resource Group Inc. Ensuring our client's personnel have the appropriate skills, abilities, and knowledge to safely and effectively perform their duties is Infinity's goal. Training plays a pivotal role in the development of an organization's personnel and ensuring they can safely and effectively perform their duties. Infinity Instructional Designers utilize the ADDIE (Analysis, Design, Development, Implementation, and Evaluation) instructional design model, which represents a dynamic, flexible guideline for building effective training and performance support tools. All courses developed by infinity make extensive use of experiential learning. 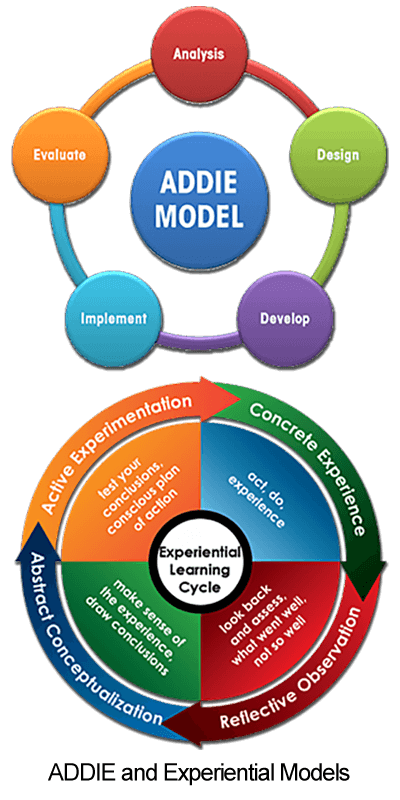 The experiential learning cycle consists of 7 stages as seen in the image to the right. Adult Education is centered on the learner and utilizes a variety of techniques to maximize the transfer of knowledge. Utilizing adult education theories ensures that each learning style is addressed and allows for an enriched learning experience. The facilitator is responsible for facilitating the learning experience and drawing upon the experiences of the learner to drive the learning process. Focusing on the various learning styles, insures that each learner is as engaged as possible in the learning process. In addition to the experiential learning cycle and learning styles, Infinity also employs the latest in classroom technologies to ensure that all learners have a great classroom experience. Couple this with professionally developed presentations and an environment is created, which is media rich and very conducive to learning. Adult Education, the utilization of the experiential learning model, and attention to the various learning styles, as well as the learning environment will play a pivotal role in the success of your training program. As such Infinity is your choice for providing the best value for your training dollar and with the addition of e-learning capabilities as per our blended learning method of program delivery, your organization will benefit from enhanced scheduling flexibility and a rich media environment.